Sporting a harsh, old-school sound, new Finnish death metallers Lantern have produced their first LP, the simply-named Below. With a name like "Lantern" I was actually expecting a doom metal sound from them (that sounds like a great doom metal name), but in fact, one gets treated to a echoing, messy production similar to initial releases by Morbid Angel. 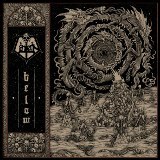 You can forget about cleanliness when listening to Lantern, because listening to Below puts the listener in a sonic sewer, filled with praises to Satan and lovingly crafted by the band. The first few bars of Rites of Descent, the first track, makes the listener feel like he's sitting in a small venue listening to an opening act. Everything is low-fi, from the abrasive guitars to the echoing drum kit that sounds like it was recorded in a corridor in somebody's basement. The melodies are grim and bleak, blurring a line between black and death metal, and rather than heavily compressed, face-melting riffs a la Obituary, the band opts for a rougher-hewn attack in both guitars and vocals, but with the bass mostly in the background as a dull hum, such as in Revenant, which starts with only the vocals (which never quite reach Cookie Monster territory, and are almost clean at times) of front man Necrophilos, mixed with the solos of fellow collaborator Cruciatus, who plays all the instruments. It seems like the guitar is the favored instrument in this case, as the bass gets mostly short shrift, though the drumming is fairly inventive and goes very well with the harsh barks of Necrophilos. Manifesting Shambolic Aura is one of my favorites from this album, starting with a thrashy two-guitar rhythm and manhandling the listener with a series of medium- to high-speed melodies, all combined with those old-time solos, which get a lot of time on this track and let the listener appreciate the deconstructed rottenness of the distortion used. Demons in My Room is slower-paced and doomier, but after an interlude, gives way to the machine-gun drumming and tremolo-picking of From the Ruins. This piece dips further still into black metal, but the breathlessly choked-out vocals and the complexity of the guitar are still very death oriented, as is the brutal assault comprising most of the track. Occasionally the music stops for breaks as the guitar sullenly chugs along on sustained notes, until flaring up again in the next furious blast, finally fading out. This one is going to be a treat for old-school enthusiasts, as the rough production only adds to the overall coldness of Lantern's evil-sounding product. I found this one quite enjoyable, and recommend it to anyone with a taste for a raw, no-frills release that brings back the early days of death and black metal.